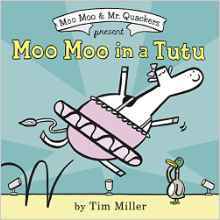 In the classic tradition of George and Martha, Elephant and Piggie, and Frog and Toad comes Moo Moo and Mr. Quackers in their debut, Moo Moo in a Tutu. A cow who wants to be a ballerina? Are you for real? This is a hilarious, one-of-a-kind friendship story between an adventurous cow and a very loyal duck that will have you quacking up all the way through and applauding for more. Check it out! Be sure to check out these fun activities for kids based on Moo Moo in a TuTu! The most adorable part of this book that resonated with my older child was that Moo Moo maybe not be the best in her journey to learn new skills, but she puts all her time and energy into trying new things, no matter the outcome. She’s brave, she’s resilient, and she never gives up! Moo Moo’s ever present Mr. Quackers may be skeptical but always cheers his friend on from the sidelines. It’s a beautiful testament to true friendship. Moo Moo has decided that once she has decided to retire her tutu thinking she’s on top of her game, her next journey involves becoming a trapeze artist, which Mr. Quackers is willing and ready to cheer on Moo Moo’s latest endeavor. Mr. Quarkers may not be the main character in this particular Moo Moo & Mr. Quackers book, but his ability to encourage Moo Moo’s grand ideas is a great lesson of friendship and sportsmanship which is perfect for kids and adults of all ages. Love! About the Author and Illustrator: Tim Miller is an author and illustrator. He studied at the School of Visual Arts, where he earned his BFA in cartooning. His first picture book, Snappsy the Alligator (Did Not Ask to Be in This Book), received four starred reviews. Publishers Weekly called his illustrations “bold and goofy.” He is also the author-artist of Moo Moo in a Tutu and the the illustrator of the middle grade Hamstersaurus Rex books. He lives in New York City. You can see more of his work at www.timmillerillustration.com. The illustrations really remind me of Elephant and Piggie!